And now, you need to know about this cup of soup. It's of the Broccoli Sunflower Seed variety, and it's incredibly delicious on a cold, rainy day. (It's been a cold, rainy week up here in Michigan. Yuck...I say YUCK to that!) The original recipe was posted on VegaliciousRecipes, but I made a few tweaks and eliminations to accommodate my own personal taste buds. Since the hubby was completely uninterested, I was able to eat off this soup for a few days and I absolutely never got sick of it! I've always loved broccoli soups, but they tend to come boggled down by cheddar—and I am absolutely not a fan of cheddar-based soups. No, siree. Despite the slightly unfocused images, it's a real burnin' way to increase the intensity of your squats. Because really, how many squats can you do before absolute boredom kicks in? And just like cheaters, bored muscles never prosper. So try it. I'll be doing them in Circuit Sculpt on Friday, that's for sure! (If any of my Sculptors are reading this, don't say I didn't warn you!) 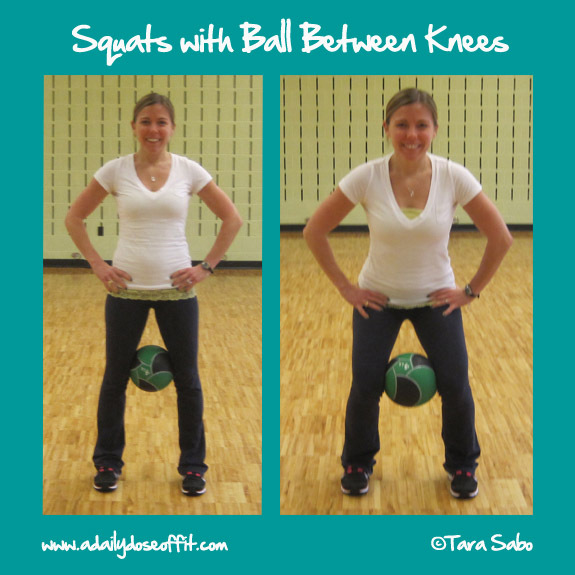 Just place a medicine ball in between your knees, squeeze it with your legs, and proceed to squat as usual. Not only will it work your legs, it'll increase the effort put forth by your glutes and your inner thighs. And who doesn't like to keep those areas tightly toned? Gina also mentions BodyRock in the same post. It's another website that I recently came across, and I've been keeping my eye on it for a week or two now because Zuzana posts some really awesome body weight exercises. Check it out if you need something new to do in your home gym. Or your outside-of-the-home gym. You bet I'll be rockin' my clients' bods with some of her moves! Until then, It's Wednesday. We're halfway through the week and I've got another giveaway scheduled for tomorrow. Don't miss out on your chance to win...well, you don't think I'd honestly give it away, do you? Tune in! Question: How do you stray from the norm when it comes to squats?